But even Peter Griffin forgets what Bixby's called. Samsung gives me smart home fatigue. Enough about Smart Things, enough about how a thousands-of-dollars TV can connect to a new thousand-dollar fridge or washing machine. Enough beautiful families showcasing features in beautiful houses that I can only dream of living in. 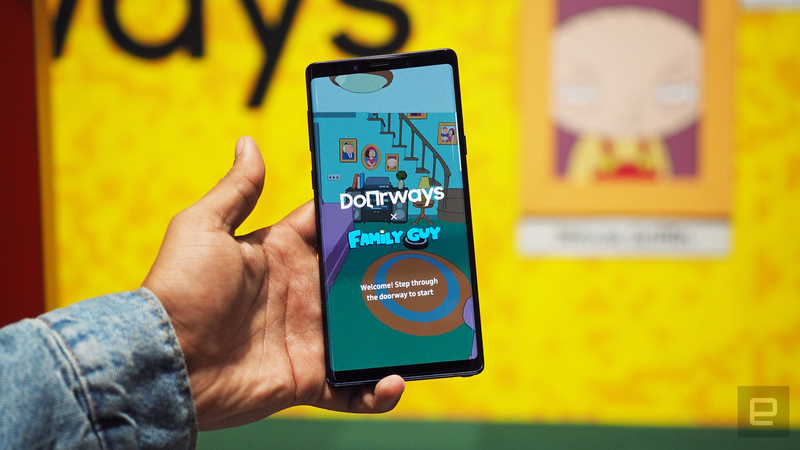 Samsung's leaning on augmented reality and some Family Guy branding to show the kind of tasks that can be accomplished with connected home assistance -- and make it a little more, well, friendly. With Samsung Galaxy Note 9 in hand, I pointed the camera at an AR doormat to calibrate to the empty room, transforming it into the Griffin household you know and love/tolerate. 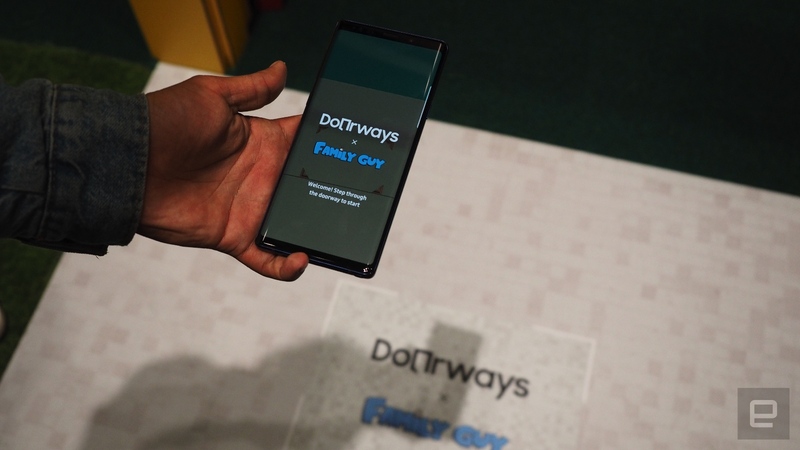 Samsung's Doorways, which launched at Berlin's IFA this week, is an interactive demo (powered by its Google's AR Core tech) that tries to immerse users in a virtual world that showcases the company's smart home features and products. While this time around it's Family Guy, the team behind it is planning future experiences from other well-known fictional properties. It's not just for fun. Of course, the aim is to demonstrate how a connected home might be worth the (heavy!) investment, hopefully in a way that is both familiar and compelling -- and that's why I'm doing virtual chores for a hungover Peter Griffin. Don't get me wrong: It's still a hard sell, but this does a far better job than the smug fictional households happily demonstrating their double smart ovens and double washing machines. This dysfunctional home is at least relatable. Your phone, projecting the inside of the Griffins' house, also points out which household appliances are connected to Samsung's intelligent home network. Preparing the food, picking the music and ensuring the laundry can all be done from your giant connected Samsung TV, with Spotify playlist choices accessible from the fridge door. Bixby will also pipe up to guide you to where the music will play from, with even your smart lights adjusting to suit the mood. Naturally, Peter's musical choice is awful. Ian Heartfield, Chief Creative Officer at BBH London, the agency who helped create Doorways, said: "For many consumers smart devices and the Internet of Things can seem like a complicated concept....This need to bring it all to life for consumers is why we developed Doorways." It was a team effort: MediaMonks were the creative digital production partners, while Family Guy's production team worked with BBH on both the narrative and experience. Doorways will be making more appearances at "major tech events across the world" and will be setting itself up in cities including London and New York. The highlight of this debut 'experience' has to be when the Griffin patriarch has trouble remembering Samsung's smart assistant name. That's pretty wry for a very buttoned-down company like Samsung, and I liked it. I might still not care hugely for the smart home in its current form, but this is involving and well, held my attention. Smart home demos usually never do that.